I didn’t sleep very well last night – had some weird nightmares that made me toss and turn. I knew that it would be the sleep I got two nights before the race that would count, but I hoped that the nightmares weren’t foretelling a bad race. Unfortunately, when I woke up enough to notice, I realized that there was a steady rhythm coming from outside my room… could it be? Ugh, yes – more rain! No! 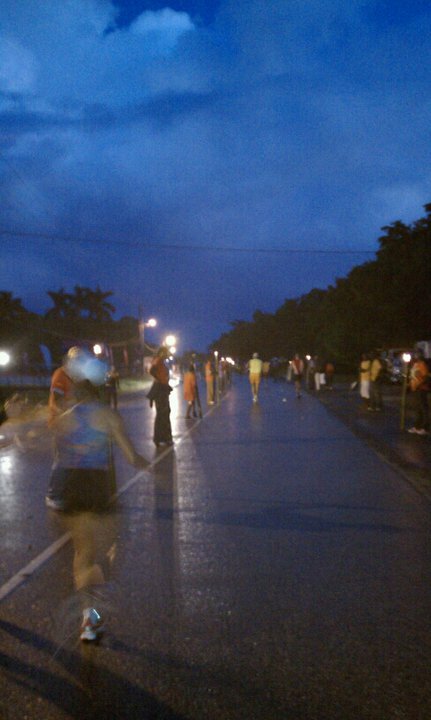 I had already done my first tropical marathon (Honolulu in 2008) starting in a rainstorm, and it was a miserable experience. 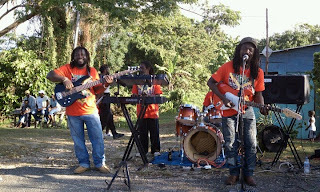 Reggae had seemed so promising but now I worried that it would be just a long trek to slog through. When the bus pulled up to the start (and I do mean pulled up to the start – basically just as close my VIP NYC Marathon bus had gotten me! ), I marveled at how cool and unique it was. 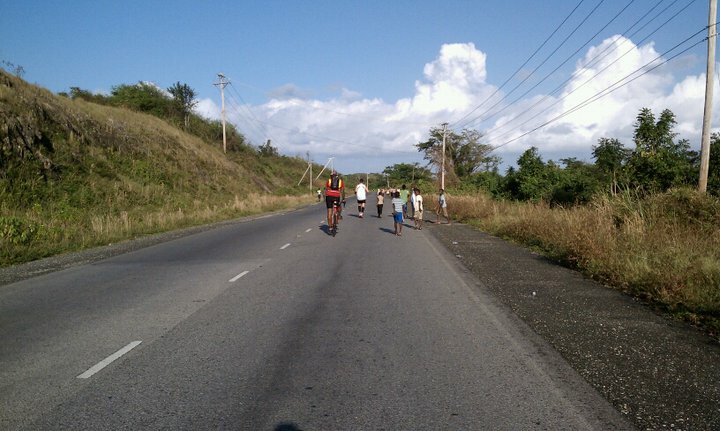 With a reggae band playing in the background, schoolchildren on either side of the road were getting their torches lit – these would line the dark roads in our sendoff from the start. 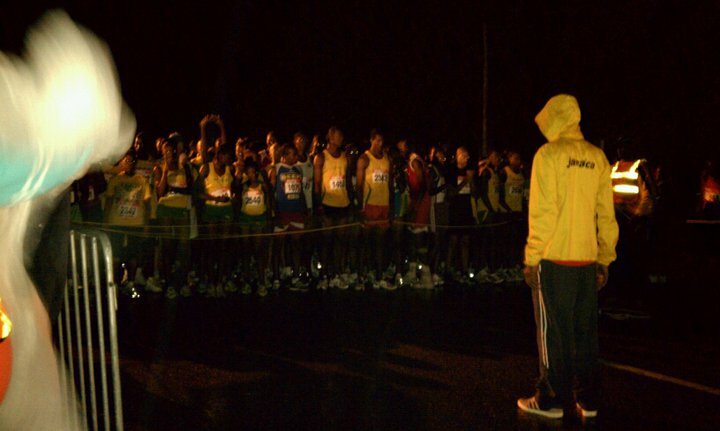 Meanwhile, a reggae steel band was playing next to the start, getting us all pumped up… and in front of the starting line, dozens of Jamaican runners were dancing wildly to the energetic beat. It seemed to be their way of warming up, and it was an awesome sight to behold! I marveled at it, but before I could think to take out my camera and put it into video mode, the dancing ended and the runners started heading back behind the line. Oops! I realized it must almost be time to start. I snapped a quick pic of the torchbearers, at least, all of whom seemed quite content to be volunteering, even in the rain. I quickly dashed over to the bag check to ditch my umbrella and beach bag (strategically packed with a towel, swimsuit, and flip flops, for after the race), but held onto my New York City Marathon heat sheet. I normally take those with me to future races to stay warm at the start (which in this case, was definitely not necessary); however, here it would be great to shield me from the light rain while I waited for the race to start. When I returned to the starting line, I found that the elite runners were all lined up and ready to go, toeing the line every bit as proudly as the elites at NYC. Neat! 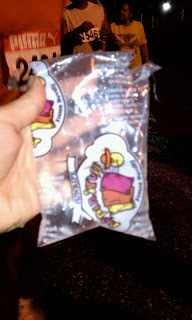 I decided to hit up the water table for a quick drink to whet my mouth before I started running, and found that the volunteers were handing out sealed baggies of water that reminded me of melted ice packs. Confused, I took one, but when another runner told me that these packets were the form that all the hydration along the route were going to take, I drank it eagerly. 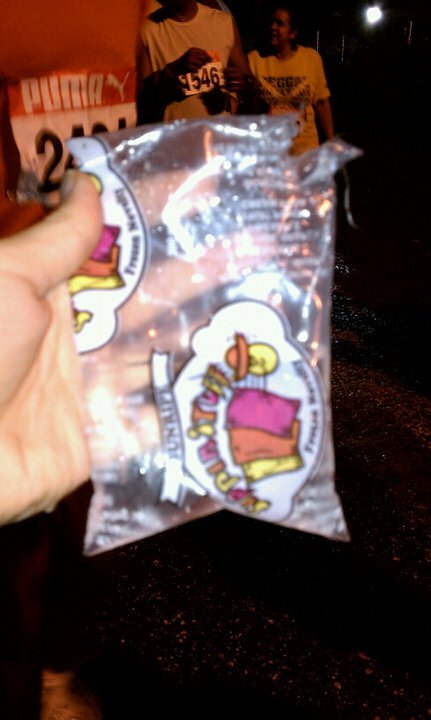 I had never been given a baggie of water before, so I wanted to get used to it before I got out on the course. The starting announcements were brief, and having only done one real international marathon before (Calgary, way back in summer 2008), I was thrown by the fact that there was no Star Spangled Banner. Have to remember that I’m not in the US! The starting announcements were very brief – basically just a welcome and then a command to start. I liked that – more races could take a cue from the idea of not going on and on longwindedly while the runners are raring to go and cooling off from their warmups (whether routines or clothing ditched). 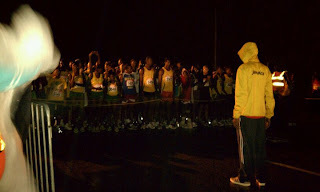 I was also pleased to note that it started very promptly at 5:15am, which reinforced the fact that this race was by runners, for runners. A non-runner might think that it doesn’t matter if the race starts at 5:15am or 5:20am, but for crazies like me who often travel right after a race, that five minutes can mean the difference between making your flight home and missing it – and it’s not always easy to make up the time during the race. Kudos! However, the short announcements and my somewhat late arrival to the start meant that I completely forgot to get my Garmin satellites queued up – whoops! When the gun went off, I was still trying to get my watch to connect to the satellites – not an easy task when you’re in a crowd of runners. There was a perfect gap in the starting barriers that allowed me to step to one side and allow other runners to pass me while I waited for my satellites to pick up… but even after patiently waiting for a minute or two, it still wasn’t syncing. The last runner passed me by, and I decided I’d just need to go without my Garmin – I’d have to turn it on later in the race. This was one of those times when I cursed myself for not reading the Garmin manual more carefully – I know there is a way to start the time without having the GPS linked up, but I have not for the life of me been able to figure out how to do it. Anyone want to tell me? Regardless, I crossed the start line and started the CardioTrainer app on my phone. I knew from past experience that the GPS distance would be way off, but at least I would have a good idea of my time, and I could use the mile markers on the course to figure out where I was (what a novel idea! Seems we’ve forgotten about doing that ever since the invention of GPS devices). 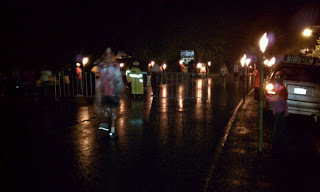 The first mile was dark, once we left the rows of torchbearers, and at times I found myself wishing for a flashlight. 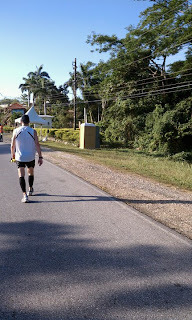 It was easy enough to just follow the runner ahead, but since I had started at the absolute back of the pack, I was much faster than most of the runners around me, so I need not to follow but to pass. Amazingly, there weren’t too many groups of people that were walking/slowly jogging several abreast, and for the most part, I didn’t find it too hard to get through. I kept flashing my phone on to light up the face of my Garmin (I hadn’t set the backlight on and didn’t want to interrupt the GPS calibration to do it now), but it wasn’t until about 10 minutes in that I was able to get the GPS going. I didn’t know exactly where we were at that point (I hadn’t seen a mile marker yet, but to be fair, I had been more focused on checking my Garmin than scoping out the scenery). Still, I started it and just hoped for the best – eventually I could figure out how far off it was, and I wasn’t going for time anyway, so it wasn’t that critical. 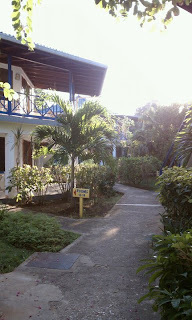 As I passed the resorts, I tried to peek in to see which looked like they might be nice. I recognized many of the names from all the extensive research I had done on Trip Advisor, but so many people on there post misleading reviews (there was a crack in the corner of the tile floor in the bathroom! This place is uninhabitable!) that it’s hard to tell what’s actually okay and what’s not. My second choice property, the Charela Inn, seemed to be pretty far down from the Negril Tree House where I ended up staying, so I was happy with my decision to go with the Tree House. There were a few people clustered at the entrance to most of the resorts, which were mostly on our right as we ran (since that was the beach side). The left had a few resorts with spectators, but mostly had groceries, restaurants, etc, and was populated with locals who had come out to watch the start of the race. As we ran through the locals, it was clear that the early hour wasn’t stopping them from “tailgating,” as I’m used to seeing at marathons. However, what I wasn’t used to was how their partying would affect me! In the US, you typically see beers, mimosas, and Bloody Marys being served up along the way; here, alcohol seemed to be a much less popular indulgence than marijuana. As my brother Erik later told me, “it’s as popular down there as Coca Cola, and everyone from teens to grandmas uses it!” I could certainly tell :) Sensing an opportunity for a lot of fun Facebook feedback, I pulled out my phone and changed my status to read, “May have just gotten high running through the cloud of smoke at mile 4… Reggae Marathon spectators know how to tailgate!” That pretty much summed it up! I found it interesting to see that when the 10K runners started coming back, there were a few marathoners mixed into the frontrunners (at least, given the numbering on the bibs). Normally, people doing a 10K would be a lot faster than those doing a marathon, since you have to pace yourself for that long of an endurance challenge. I briefly wondered if the 10K race was “less elite” than the marathon (which didn’t make sense, given that they had the same prize money), but now in retrospect, I’ve concluded that it’s possible that the marathon winners employ a strategy of going out faster than usual, since it’s hard to put the pedal to the metal once the sun comes out and the day gets unbearably hot. Something to consider for myself for next year. 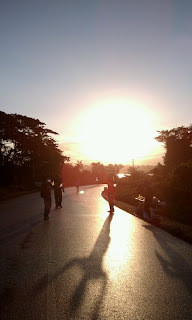 At the turnaround, there were a whole bunch of locals out, and two different car stereos blasting music. 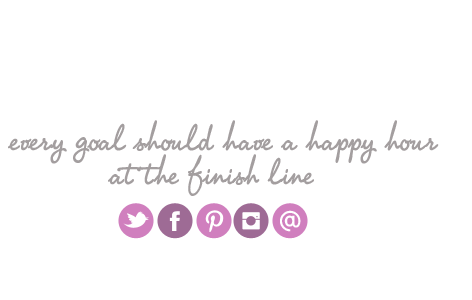 I thought that was such a neat idea of the race organizers to have a “best car stereo” competition – it’s an easy way for people to show their support, even if they aren’t musicians themselves, and it certainly gave a boost to the runners. We circled a roundabout (with a chip mat at the end of it – you’d think that would be standard, but I’ve done plenty of chip timed out-and-back races where they don’t bother making sure you go to the end), and then it was back the way we came. I enjoyed seeing who was behind me even more than I had enjoyed seeing who was in front of me, in large part because it was now just the teensiest bit lighter out and I could see better. By this time, I had also figured out that my Garmin was almost exactly 1 mile behind – which, if I had to start my Garmin late at all, at least made calculations easy. In a way, it was kind of fun to look down at my watch and then get to subtract a whole extra mile from the distance that I had yet to run! As we made our way back up the strip of resorts, I ran into another frequent marathoner, Paul, whom I had met both the night before at the pasta party and again that morning at the hotel breakfast. We ended up running together for the next several miles, exchanging stories about other marathons while we gave me the lowdown on this race. This was Paul’s third year running the Reggae Marathon, and he heartily agreed with me that it was one of the best-run marathons he’d done. I think his coming back every year is a strong testament to that! Paul and I ran together for a few miles, with him even graciously waiting up for me when I stopped to take a quick pic as we ran back through the torches at the start. The sun was just starting to come up, so while I couldn’t see it, the sky was a gorgeous royal blue color that looked beautiful against the flaming torches. 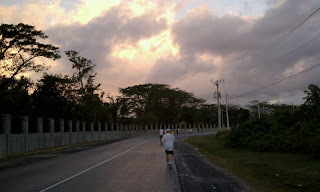 We ran by a few more resorts, with the sun rising higher and higher and starting to lighten the day. 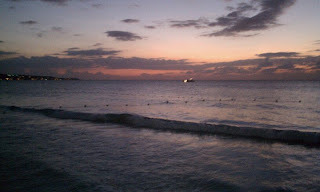 I tried to take some pictures of the sunrise, but they didn’t come out great due to the angle. While I was willing to stop running to snap a pic, I wasn’t about to go off the course to get a dif angle! So the sunny glare picture is what you get – it gives you a good idea of what the run was like. After running a few more miles, I soon realized that I was starting to have GI issues. Curses! I wasn’t in bad shape (yet), but knew that I would be hitting a porta portty before long. Though, come to think of it, I didn’t remember seeing porta potties so far. I asked Paul, and he said there was one every mile or two – I probably had just missed them when it was dark and I wasn’t looking for one. 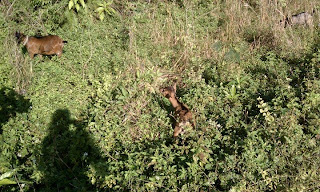 But as we came up to the next aid station, I saw the familiar shape… and saw a runner exiting. It was free! My lucky day. I said my goodbyes to Paul, telling him I’d catch up with him later at some point, and headed for the bathroom. It didn’t take me too long and I was soon heading out again – this time with new faces around me and a lovely sunlit pink sky. I started chatting with a couple from Kansas, for whom this was their second marathon. The wife was doing better in the heat than the husband, and I offered to run with him if she wanted to go ahead, but they said they wanted to stick together. However, a mile or so later, as we were going up and down some rollers, the wife did indeed go on ahead and I didn’t see her again – hope she finished strong! This left the husband and I to run together. Craig and I introduced ourselves and commiserated about the heat. I decided by now that since the weather was reminding me of Honolulu (rainy start, heating up throughout the race), I was going to take a cue from that race and aim to enjoy myself instead of worrying about getting a fast time. To that end, my plan was to take lots of pictures and make lots of friends along the way. 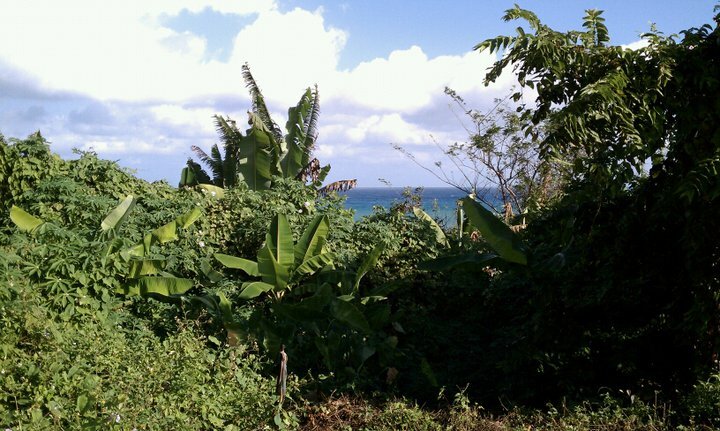 After all, making friends is a big part of the Jamaican spirit – gotta be like the locals! Speaking of which – they were definitely out in full force. As we moved from the resort areas to an alternating mix of small towns and woods, we found that there were lots of spectators out to cheer us on. My favorite sight (that I was too afraid to take a picture of): a policeman and policewoman (in uniform), out to cheer on the runners… while smoking something that definitely did not smell like cigarettes. Too funny! On the plus side, when I finally did get out of the bathroom, the weather actually felt cool and breezy. That darn porta potty had been so stifling that it was a literal breath of fresh air when I came out! Onward I went, feeling a thousand times better now that my insides weren’t quite so rumbly. Note to self: when doing a hot and humid marathon in the tropics, revert to taking Immodium beforehand. Nothing worse than heat + humidity + tummy troubles! They eventually stopped running, so I caught up with Craig and his group of pace buddies. 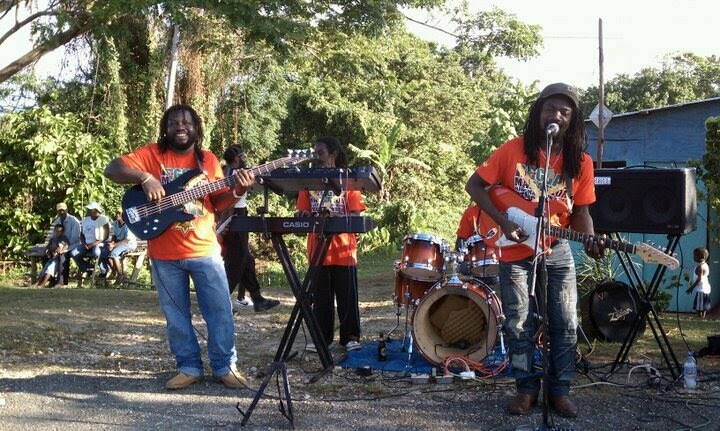 After we left our “pacers” behind, we got to go past another Reggae Band, which I loved. 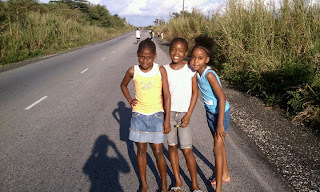 They were all smiles and just seemed so happy that we were all out there running. And then we were at mile 16, which opened up to a great ocean view! Just ten miles still to go – yippee. And while I was taking pictures, I caught one of a local runner (doing the entire marathon barefoot!) who stopped to pose with Craig. On one of these walk breaks, as we headed up a hill, we caught up to some other runners, including a woman who was walking at a slow pace. I advised her that walking at a faster clip would still provide her the necessary break from running, but not slow her time down as much. She gave it a try and realized I was right. I’m not saying you have to powerwalk, but sometimes you might find that it takes less energy than you think to pick up the pace. In speaking with the woman, Craig had fallen behind, and at the next aid station, the woman fell behind as well. I eventually looked back, but seeing no one behind me, decided to just keep going alone. I felt kind of guilty for not sticking with Craig, but I found that being alone was rather peaceful and energizing! I enjoyed the beautiful scenery as I ran, pausing to pick some gorgeous purple flowers to stick in my hair (unfortunately, they kept falling out). I even stopped to see some really cute goats just hanging out on the side of the road! How neat to see such different flora and fauna. Being on my own, I now started getting stopped by bike volunteers pretty frequently. The first time, my first reaction was, “oh no, do I look like I’m doing that terribly that volunteers have to stop and help me?” But by a few times later, I realized I was looking fine – it was just that the race organization/volunteers were so awesome that they made it a point to check in with all the marathoners and see if anyone needed anything! 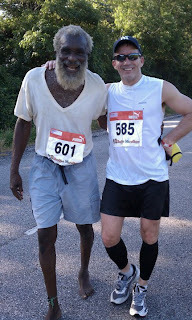 They offered me water, Gatorade, Gu, sunscreen, medical aid… or just some conversation to make the miles go by faster. This race was truly the perfect mix of being a small race and a large race, because the marathon field was so tiny they were able to provide this kind of special service, but the 10K and half marathon fields were large enough to warrant a great pasta dinner and finish. Furthermore, I was thrilled that despite the marathon being so small compared to the other two races, we marathoners were made to feel just as important as the short distance runners. Before long, I was at mile 21 – and it couldn’t come fast enough. By this time, it was brutally hot and sunny, and the rolling hills were no longer a nice change of pace – I wanted it to be flat! But with only 5 miles to go, I was getting close. In counting down the miles to go, I again employed the strategy of only counting to 25, since I assumed the last mile would be full of spectators and not that bad. So when I crossed the 22 mile mark (going over a bridge by a really pretty inlet), I pretended it was only 5K to go. Not that bad! 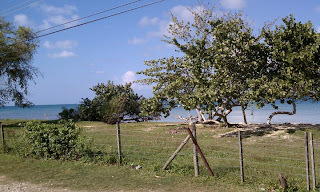 As I started getting closer to Negril, resorts started cropping up, with spectators out to cheer us on, and lots of bands along the way. 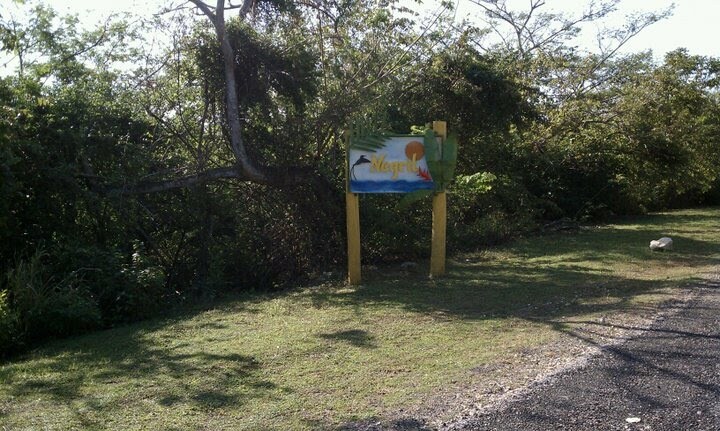 Finally, I saw the “welcome to Negril” sign – almost there. Just in case we hadn’t caught the connection, at mile 25, we found a big sign proclaiming it to be “Bob’s Mile.” Every few hundred feet, we’d come across a little sign with a quote from one of his songs – one reminding us to relax, enjoy Jamaica, and enjoy the race. Unfortunately, I was so focused on getting to the end at this point that I didn’t snap any pics. Still uplifting! Despite my feeling that I was sluggish and wiped out, I was still passing people in these last few miles. There were a lot of people taking walk breaks, and while I would have loved to acquiesce and do the same, I tried to just keep jogging. The sooner I got to the end, the sooner I could stop running and just collapse into the ocean! I was definitely looking forward to napping on the beach later. 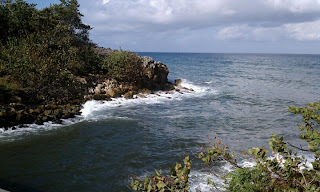 By 25.9, we were running almost right next to the beach, and it was calling me. I snapped my last picture of the race before it was time to focus – finish right ahead! 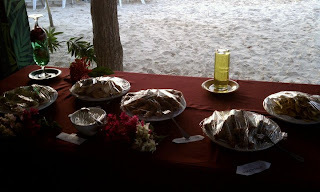 However, I didn’t have much time for handshaking and accolades – I saw a tent in front of me, piled high with coconuts, and one of them had my name on it. My friend Dave found me, and once I got my coconut, snapped a picture of me drinking straight from the nut. Too fun! Next stop was the Red Stripe tent, where I got a beer and then headed for the bag check to get my drop bag. Bathing suit, here I come! 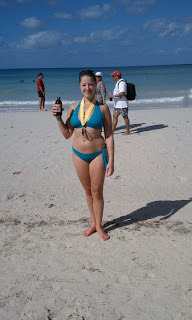 Once properly attired (meaning: bikini with medal on top! ), I dropped my stuff in the sand (except the beer, of course – that was coming with me) and plunged into the ocean. That may have been my fastest sprint of the day! 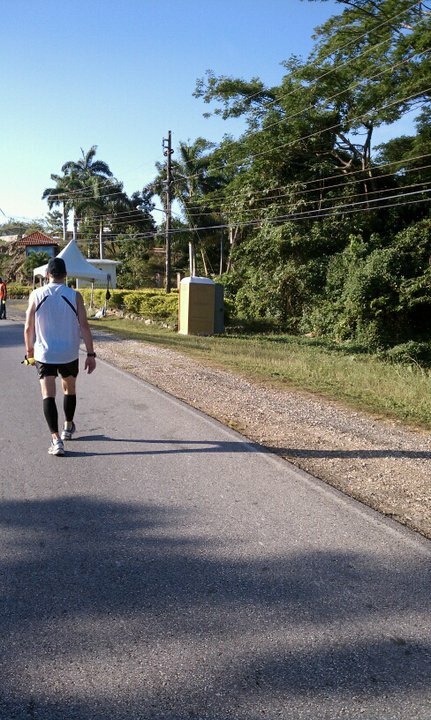 And to provide the perfect finish to the race, I got to walk back to my hote…. 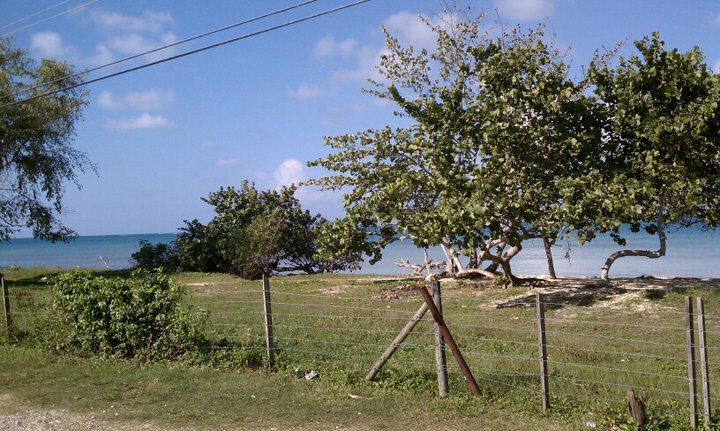 along the beach, another Red Stripe in hand. That beats a crowded shuttle bus to a parking lot any day! While walking by the Sandals resort, there was a wedding happening on the beach, and while turning my head to look at it, I missed the Sandals staff trying to stop me from continuing to walk. 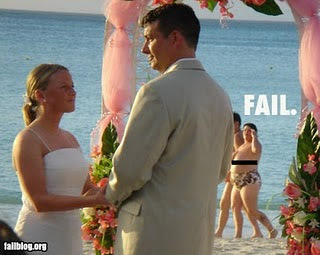 Once I realized, I gladly went up the beach and around them – I can’t imagine my pasta party-bloated, beer-drinking body would have been welcomed in the background of their wedding pictures… at least it wouldn’t have been as bad as this pic. …and a beautiful Caribbean sunset. When I ran on Thanksgiving my Garmin satellites wouldn’t catch (stupid NYC buildings!) and I was able to start the timer while on the satellite screen by pressing the right front button that you usually press to start the time when you are on the home screen and the satellites have already synced. Karen, is this on the 405? I think I’ve tried that but maybe will experiment again. Thanks for the report and all the beautiful pictures. That really looks like quite a destination… Makes me want to hop on a plane. Great report. The race looks like a lot of fun. 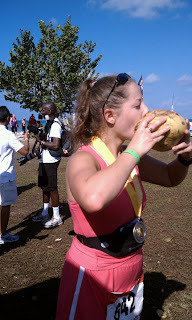 Another blogger I follow ran a half marathon in costa rica and they used baggie tubes for water too. I wonder if it creates less waste than paper cups? Anyway-looks like the race was lots of fun and the trip was beautiful. Kind of makes me want to try it next year! Sounds wonderful!! I love all your pictures, and that you were able to just enjoy the run instead of focusing on time. I expected steel drums…and got them! Good job! Hi Laura. WOW! 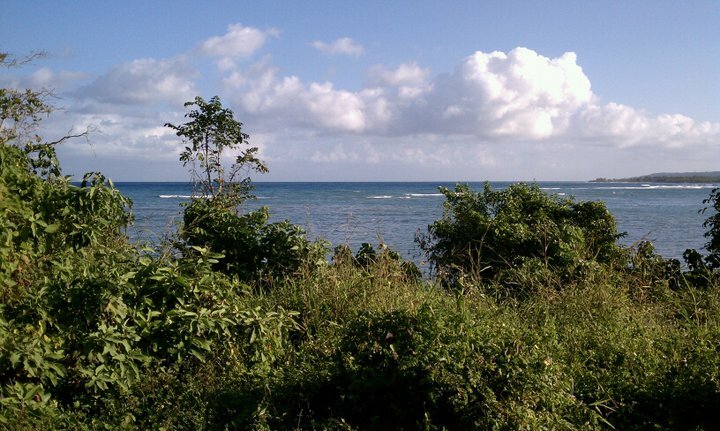 What a great detailed report on your experience at the Reggae Marathon. I’ve done it two years in a row now and still can’t believe the excitement at the start. I ran this year with my son and that was really special. 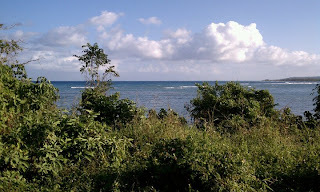 I would love to have you as a guest blogger on the Reggae Marathon blog, http://www.reggaemarathon.com Talk soon. That’s awesome! 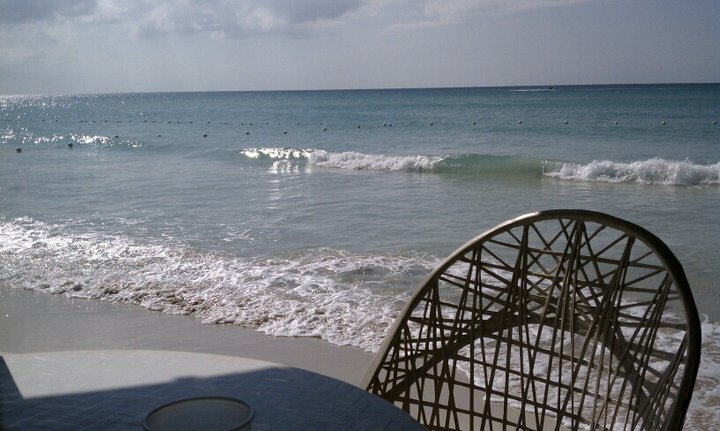 I ran the Vegas half on the 5th and then we flew to Negril for a vacation on the 6th.. I met a girl who did the Reggae half and I didn’t even know there was a half/marathon there! Pretty cool.. 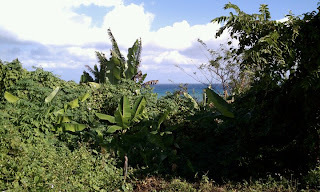 I love Jamaica!